Regular removal of your establishment's food service oil, grease and waste is essential to the maintenance of your business. Atlantic Pumping, Inc. has the capabilities to service the largest outdoor grease traps, as well as the smallest indoor grease traps, without disrupting the operation of your restaurant. 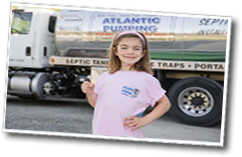 Atlantic Pumping, Inc. has service contracts available.